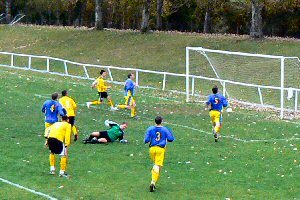 Could the 6-5 victory over Allenburys Sports in the Herts Intermediate Cup be the belated kick-start to our 2009/10 fortunes? Possibly not, although the strength and spirit demonstrated by Town's first string on Saturday should stand them in good stead for the rest of the season. Allenburys, who fielded a side just a couple of players short of the team which beat Town 3-1 two weeks ago were always on the back foot, and only sloppy defending saw this match go to a 4-4 full time score with an exciting 30 minutes of extra time to follow. Fortunately Buntingford did the business in the final 15 minutes and the home crowd went away with smiles on their faces. But, what an entertaining match!